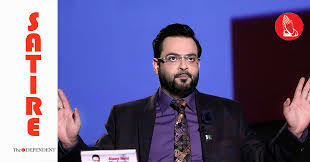 KARACHI – As the Pakistani rupee fell from 115.63 at the start of last week to its lowest value ever of 121.39 against the US dollar by day-end on Thursday, ahead of the Eid holidays, analysts around the world have warned that the Pakistani currency could eventually fall to Aamir Liaquat levels. “It currently sits at its lowest ever fiscal value exhibited in trading history, but could eventually stoop to the lowest ever moral value exhibited in human history,” Moody’s Investors Service, one of top three global credit rating agencies, forecasted. However, while analysts accuse Dar of artificially supporting the currency which made it vulnerable to sharp decline, they propose short-term fixes. “The caretaker government should seek a humanitarian bailout programme, and in turn international interference, which would ensure that no entity ever falls to such levels, and exhibit trends which can bring about an existential crisis for the country,” a senior analyst said while talking to The Dependent, wishing anonymity.